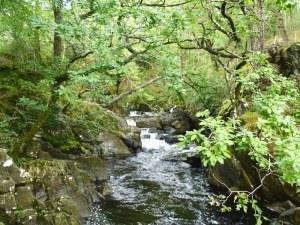 The reserve at Coed Ganllwyd includes a steep wooded gorge with high tumbling waterfalls. The main attraction for many are the spectacular Black Falls or Rhaeadr Ddu on the Afon Gamlan. Coed Ganllwyd National Nature Reserve is part of the National Trust's Dolmelynllyn estate. The main attraction for many are the spectacular Black Falls or Rhaeadr Ddu. Allow half a day to see all the estate has to offer. Open during daylight hours along waymarked routes.